Rowan Cockett's Visible Geology is an interactive tool for visualising geological structures, ideal for teaching and also for self-study. 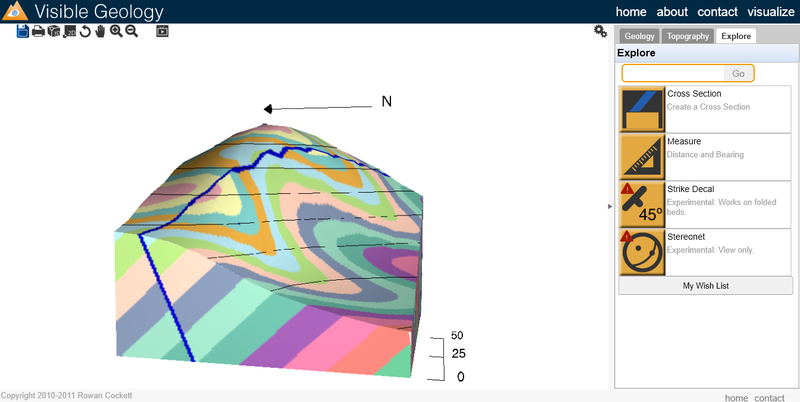 Visible Geology is highly interactive and web-based, so the only thing you need for using it is a HTML5 compatible browser (basically, not IE). I am really impressed by this simple but complete application. In Visible Geology you can create block diagrams for illustrating bedding, faulting, folding and intrusions (dykes).You can keep this blocks as a simple cube, or what is really nice, is that you can modify the topography. 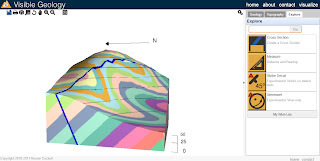 You can model top surface of the cube with a couple of easy options, drawing contour lines or selecting predefined patterns (like valleys, slopes, mountain tops, etc.). But it doesn't end there. Once you are happy with your model, you can even do cross-sections! So, easy to use, quick (very quick), very nice results... I am just looking forward having the chance of using it for some report! - Capability for choosing bed thickness. - Folding would improve several orders of magnitude if it would be possible to change basic parameters such as amplitude, wavelength, etc. It is really a great program, and I am sure it will be soon widely used in education. Go to use it, go! Link to the website has an extra space, rendered in the link as an extra "%20" at the end of the url, causing it to be 404er'd. Once I got there - WOW. This is awesome. I hoping there will be a library of models that can be searched/accessed somewhere, and that users will be able to save models they create. The ones that load on the home page seem to be random. Thanks for your comments, I am glad you liked it! You can save your models that you create, each model has a unique link that will come up after you save it. You can share this link with anyone, or embed the model on your website. You can browse all of the models by clicking "View Models" (under the geology tab) and searching for one or scroll to the bottom and click show more. A better showcase will be coming soon! OK great, I didn't see the "save" option come up but will look more closely for it. The site is a tremendous learning tool! Will definitely be working with this when I teach structural geology next semester. Thanks Charles, the link has been fixed now. I have been using Rowan's app for a while and I found it extremely useful, I think deeply from now towards future that app will evolve for great. Thanks and regards! Rowan thaaaaaaaaaaaaanks alot for such a wonderful tool!!! Now I can better visualize the structures. Rowan, I really think that this is an excellent tool. I have a question: how is possible referring to the obtained results with the app in a paper? Here's what you may expect within the next few months as we get closer to UFC 229: Reporters will ask fighters about their predictions for the Oct. 6 headliner between lightweight winner Khabib Nurmagomedov and Conor McGregor, and also these fighters mechanically will oblige with a response.